Richmont Inn is a secluded, relaxing retreat surrounded by lush wooded acres and stunning views of the Great Smoky Mountains. The Inn is located 10 minutes from the Great Smoky Mountains National Park. This intimate mountain Inn is decorated with 18th century English antiques and French paintings. The Inn's "Weekend Rendezvous For Two" makes an excellent babymoon getaway. A fireside or streamside picnic to enjoy alone in a quiet and pristine setting in the Great Smokies. 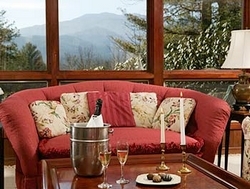 Enjoy stunning views of the Smoky Mountains and the peace and tranquility of the hemlock and pine forest from this elegant country inn in Gatlinburg, named "Most Romantic Inn in Tennessee" by Southern Bride Magazine. Period charm abounds at the Buckhorn Inn, situated less than a mile from the Great Smoky Mountains National Park and close to all the area's activities and attractions.